I received my first refusal on 13th November 2017 stating that I have an unexplainable transfer of credit on 8/10/2017. 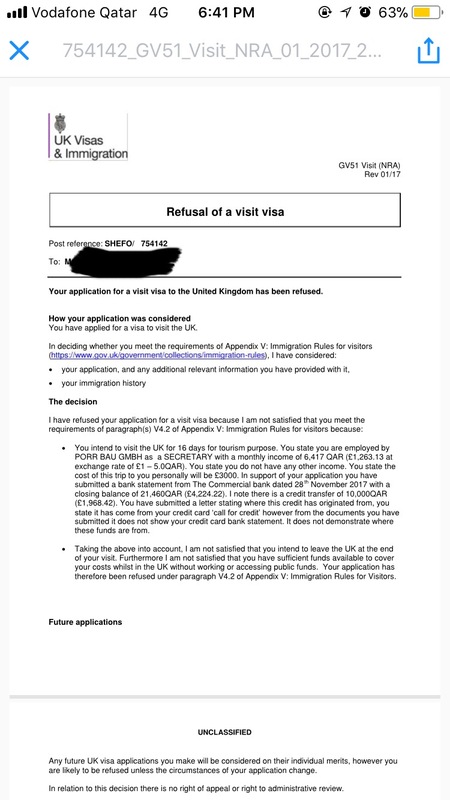 I went back to the visa application center(VFS GLOBAL QATAR) but they said whatever documents we submit, they are forwarding to UKVI and that they cannot show me the documents which they have submitted on my behalf. It is disappointing as I have paid an additional amount for their priority service. Is UKVI having some errors sometimes? I am sure that I have submitted my credit card bank statement to justify the transferred credit with stamp and signature from the bank. Thank you for anyone who would take time to read and answer. To make the long story short you cannot afford the suggested vacation and loan doesn't change it. Before card transfer, you had about 2k GBP in your account altogether, and cost of your trip is 3k while you earn 1,2k a month before paying taxes, rent, food, utilities etc. That means you plan to spend 3 full months worth of salary just to come and sightsee the UK for 2 weeks. That alone already is going to raise all sort of bells. But to make the matters worse you didn't even save up 3k, instead it looks like sizeable part of your trip comes from credit, and generally speaking, credit comes with interest. So the 3k trip, that already was a financial stretch, now also will cost you interest payments on the balance when you come back. Most people who travel don't do that, and you will have to have one hell of an explanation for the ECO to explain why are the 2 weeks in the UK so important to you.